Kelly is a Solicitor in our Litigation & Dispute Resolution Team. She qualified into the team in September 2018, specialising in property disputes and planning. Kelly graduated from the University of Warwick in 2014 before completing her Graduate Diploma in Law at UEA and Legal Practice Course at BPP in Cambridge, passing both with distinctions. During her studies, Kelly worked for another local law firm in their Residential Property Team for a period of two years and volunteered at a free legal advice centre. Kelly has gained experience in a wide range of areas during her training at Leathes Prior, having spent time in our Commercial Property, Corporate & Commercial and Regulatory & Defence teams. 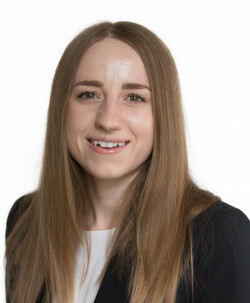 She qualified into our Litigation & Dispute Resolution Team in September 2018, where she specialises in property disputes and planning. Kelly advises and assists with property related disputes including lease renewals, dilapidations, rent arrears, forfeiture, rights of way, boundary disputes, easements, restrictive covenants, adverse possession and landlord and tenant disputes. She also deals with all aspects of planning law including planning appeals, section 106 agreements, judicial review and planning enforcement.